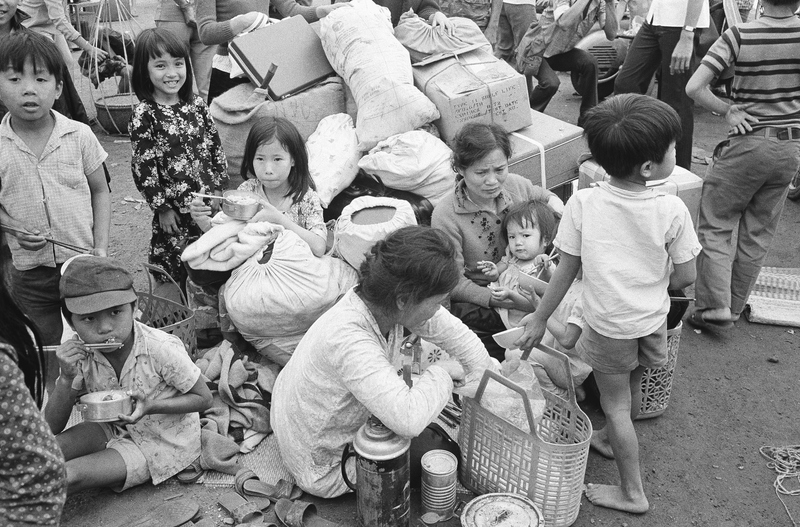 The Fall of Saigon was the capture of Saigon, the capital of South Vietnam, by the People’s Army of Vietnam and the National Liberation Front of South Vietnam (also known as the Viet Cong) on April 30, 1975. 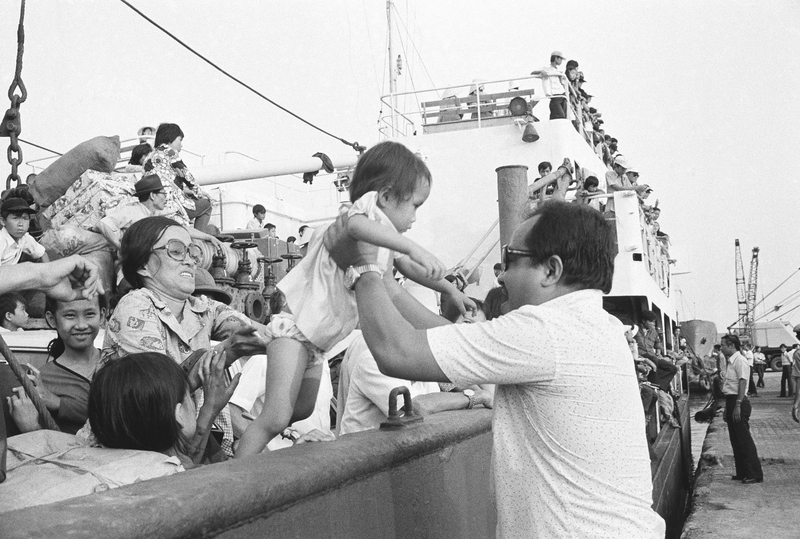 The event marked the end of the Vietnam War and the start of a transition period leading to the formal reunification of Vietnam into asocialist republic, governed by the Communist Party of Vietnam. 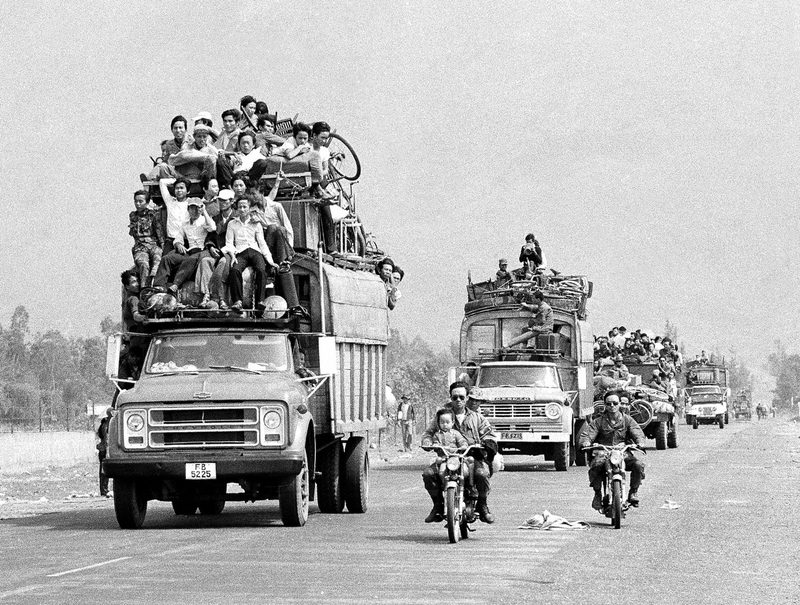 Trucks and motorbikes, loaded with refugees, roar along the main highway from the old imperial capital of Hue to the port city of Danang about 50 miles south of Hue, March 25, 1975. 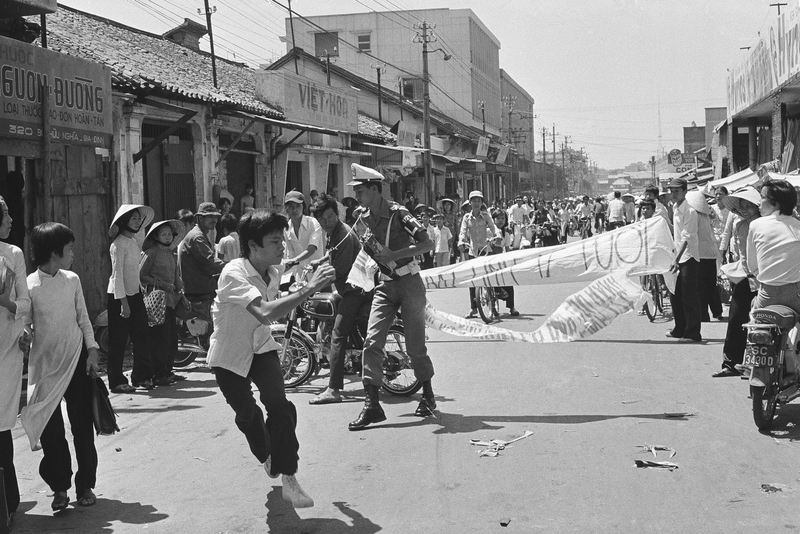 Hue’s 200,000 inhabitants have been streaming southward since the Saigon government?s decision to abandon the city in the face of a heavy North Vietnamese buildup. 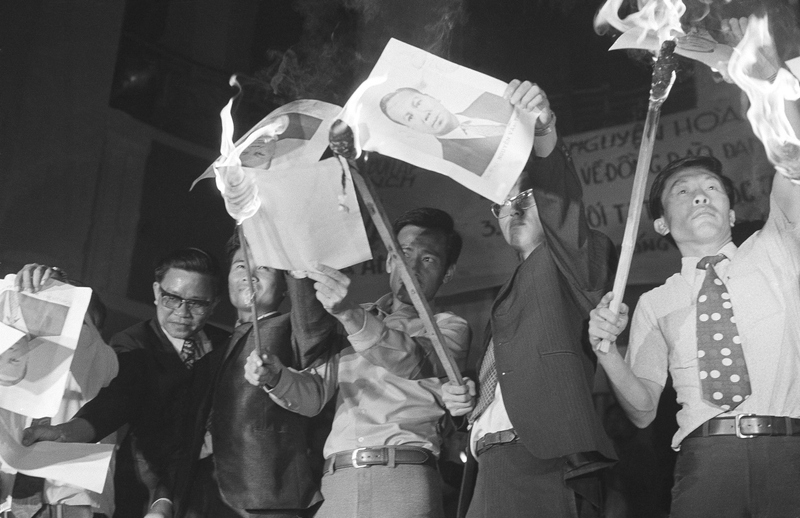 A group of opposition National Assemblymen use torches to set fire to pictures of South Vietnam’s President Nguyen van Thieu during an anti-government protest on steps of the National Assembly building in Saigon, Tuesday, Feb. 13, 1975. 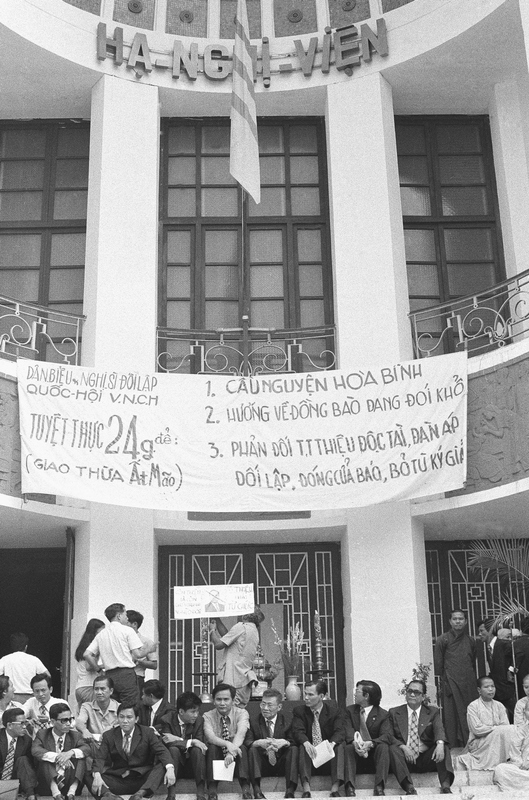 The protest, held in conjunction with the Tet holiday, on lunar New Year, renewed opposition demands for Thieu’s resignation and charges of corrupting in government. 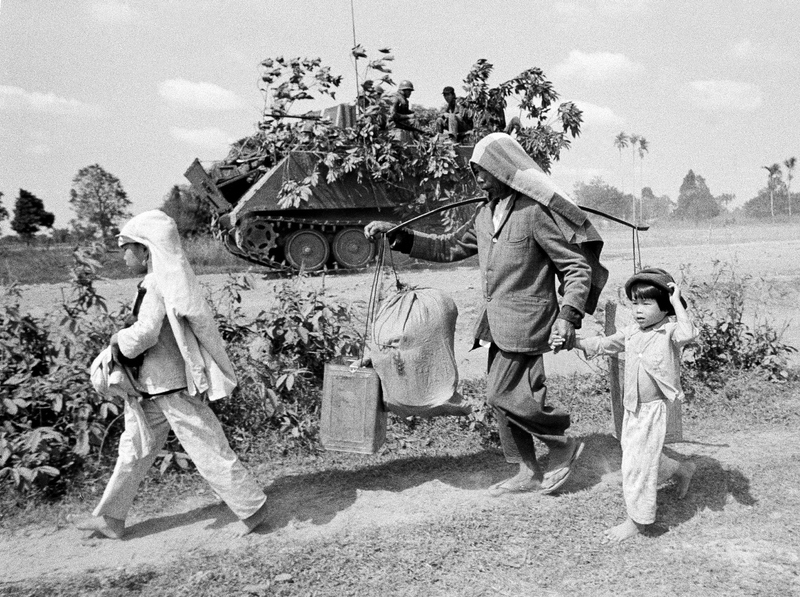 Refugees pass South Vietnamese armored vehicle as they flee from the embattled town of Tri Tam which fell to North Vietnamese troops in Vietnam, Wednesday, March 14, 1975. 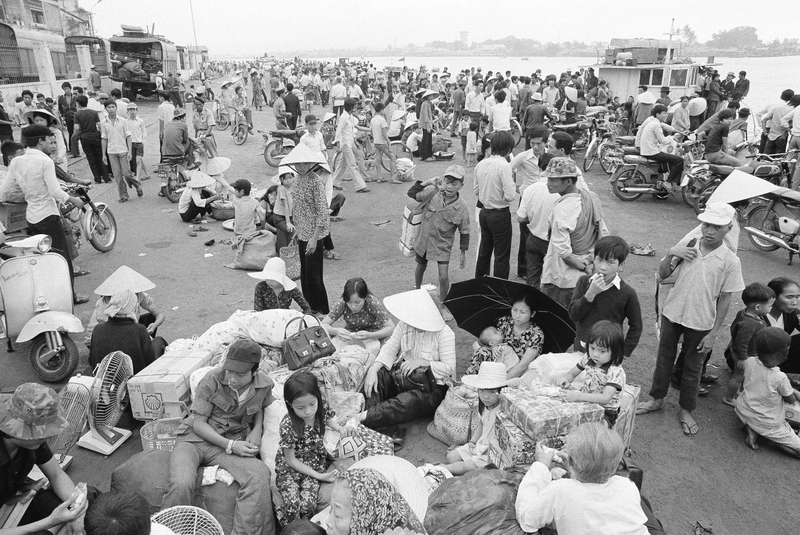 The town is 40 miles northwest of Saigon. 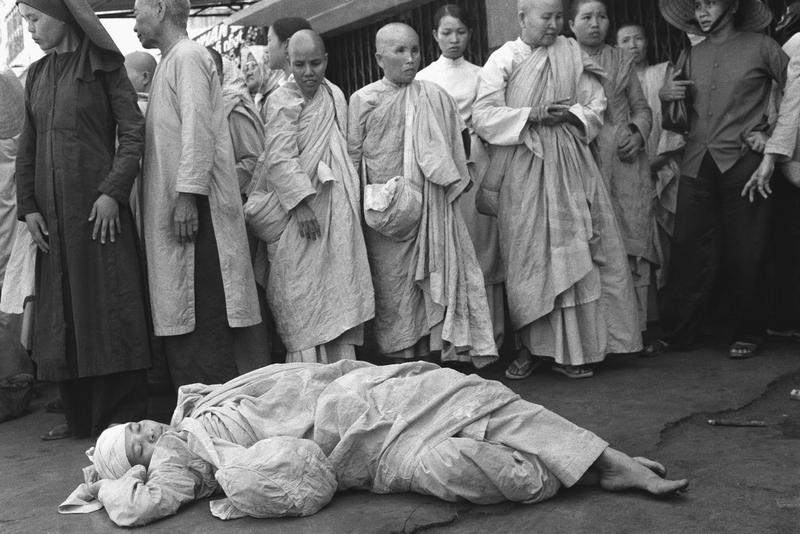 South Vietnamese Buddhist nun injured in melee between police and about 20 nuns staging demonstration rests on floor at pagoda surrounded by other activist religious in Saigon, Sunday, Jan. 26, 1975. 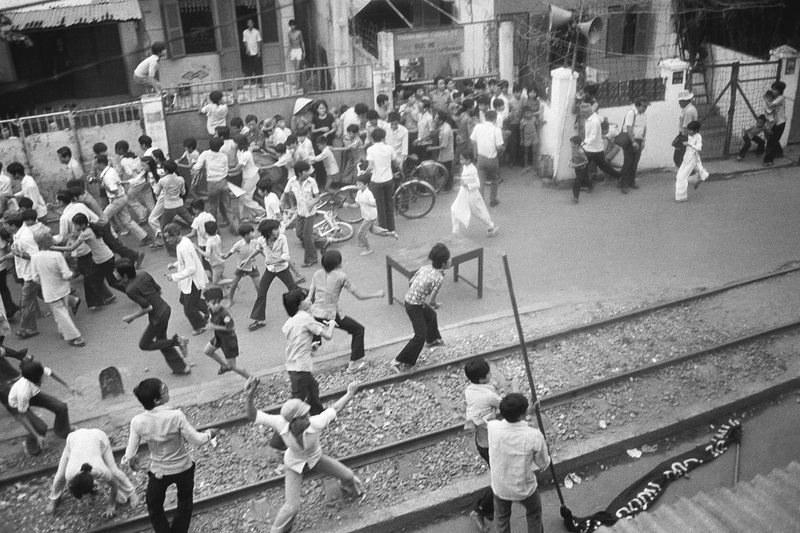 Antigovernment protest and fighting followed political convention. Four nuns were injured, none of them seriously. 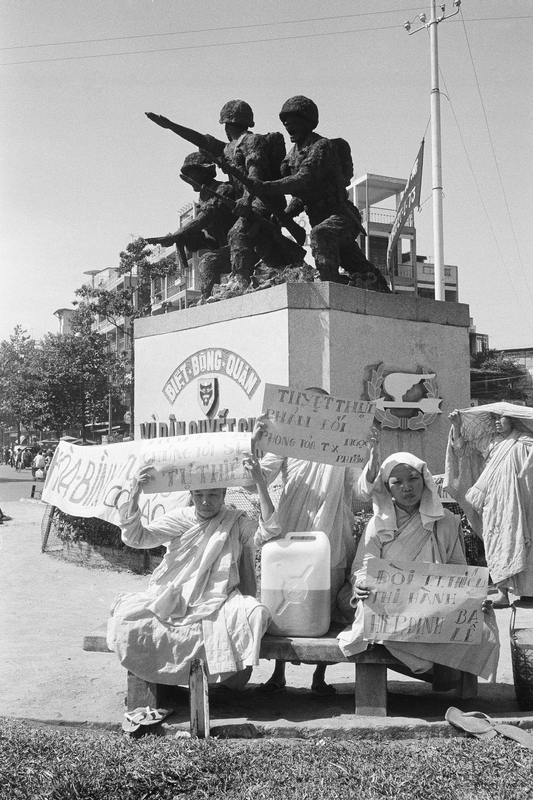 South Vietnamese Buddhist nuns opposed to the regime of President Nguyen Van Thieu and continued fighting in their country stage a demonstration in the shadow of a monument honoring combatants in Saigon, Jan. 27, 1975. The nuns called on Thieu to resign. 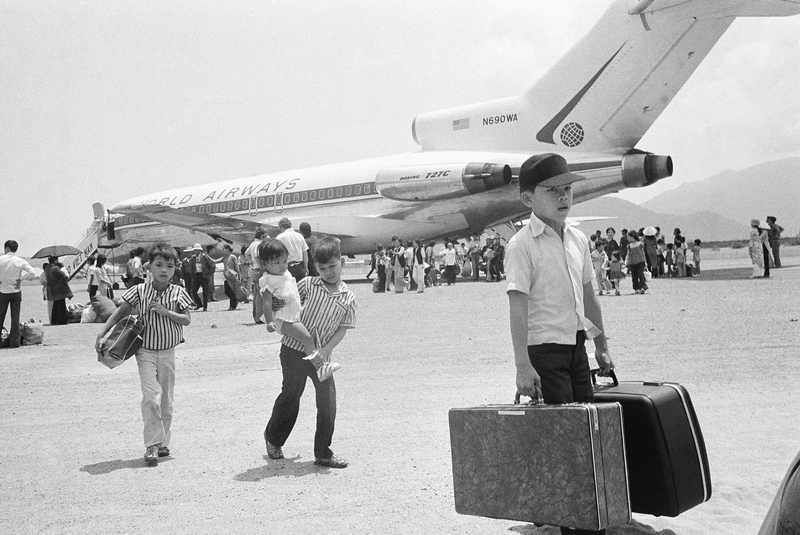 South Vietnamese refugee deplane at Nha Trang airfield in Vietnam, Thursday, March 27, 1975 following a jet hop from Danang as a U.S. financed airlift, using civilian chartered jets, relocates thousands of former residents of Hue. 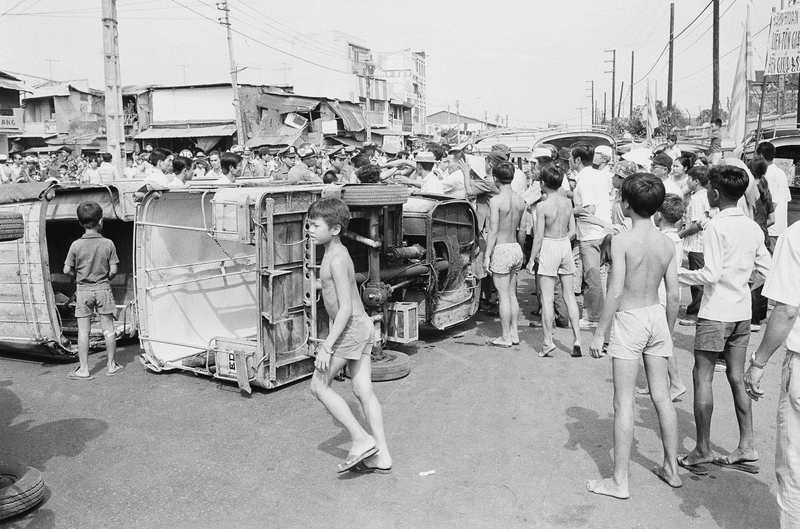 Saigon youngsters mill around overturned three wheeled minibuses during a demonstration by the vehicle’s drivers protesting various economic issues. 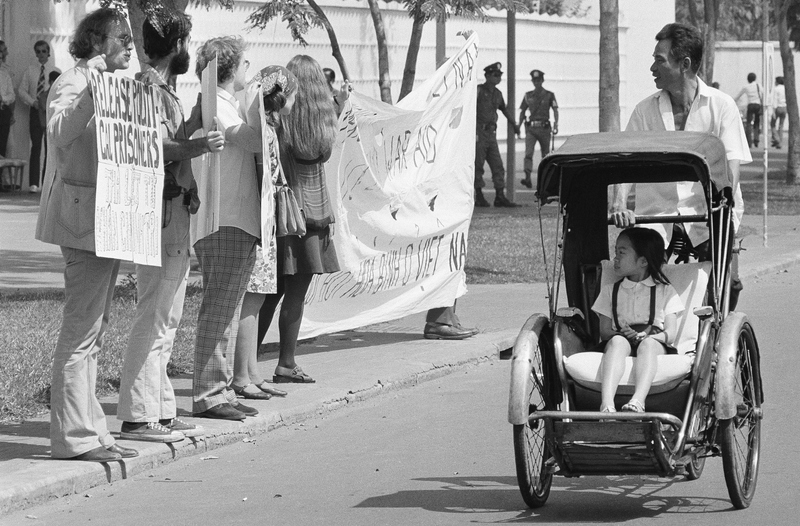 The protest was one of two which tock place, March 25, 1975 in the South Vietnamese capital Saigon. 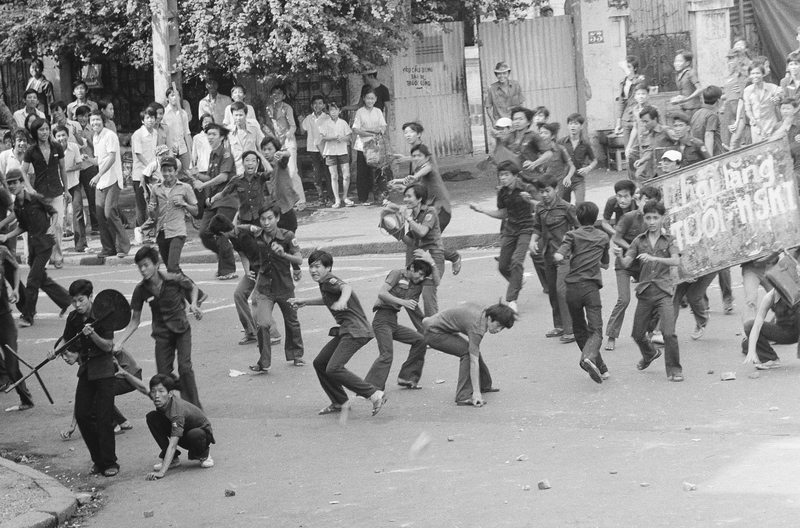 Rock throwing Saigon middle school students charge police during an anti-draft demonstration in Saigon, Thursday, March 27, 1975. 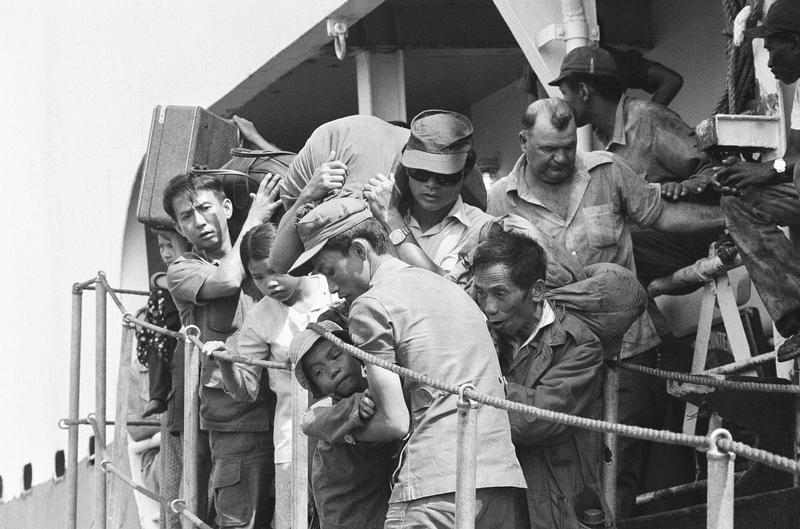 The students were angered by changes in the conscription law, lowering the draft age to 17. The change came about due to the increasingly serious military situation. 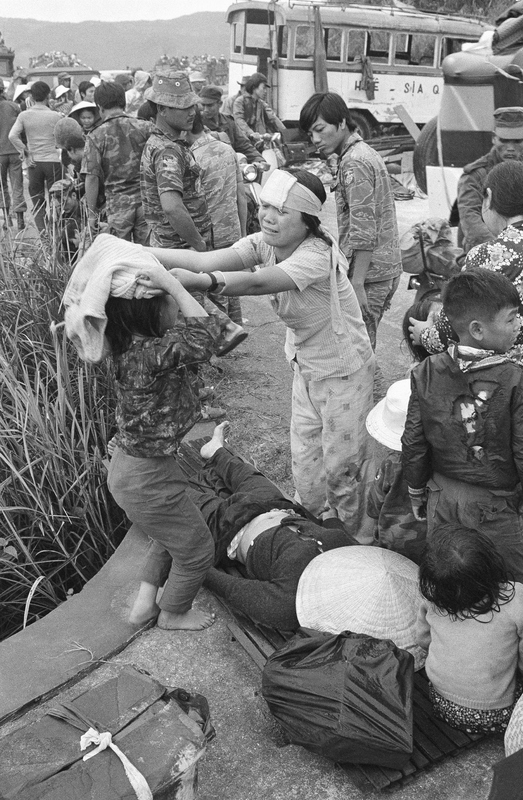 Injured victims of a road accident in the panicky flight from Hue stand over a dead woman in Hai Van Pass, March 21, 1975. 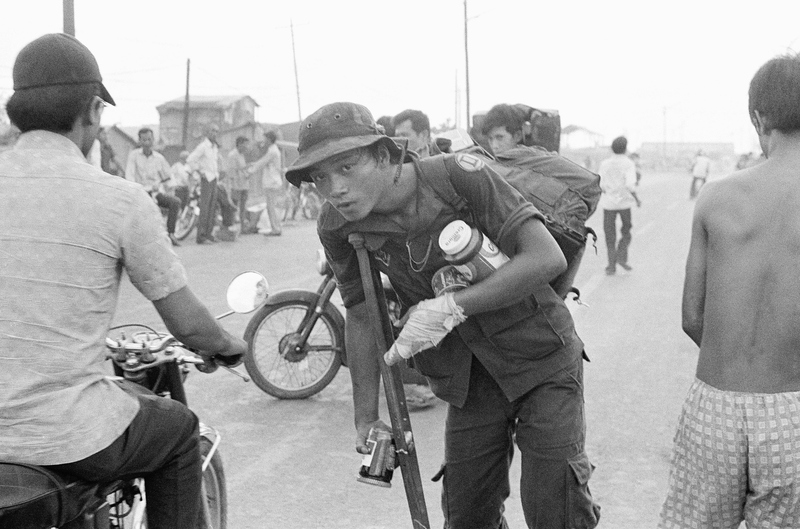 Fatal accidents and injuries were common among the thousands of refugees who fled advancing North Vietnamese, and attempted to find refuge in the coastal city of Da Nang. 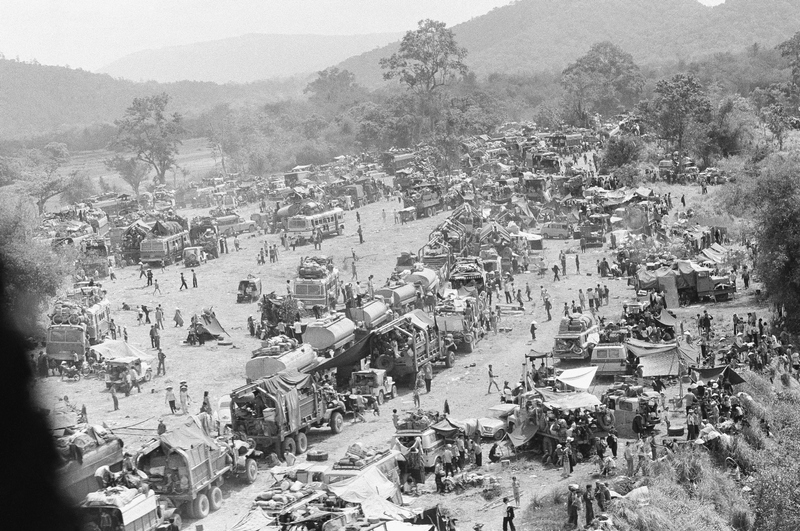 Hundreds of vehicles of all sports fill an empty area as the refugees fleeing in the vehicles pause near Tuy Hoa in the central coastal region of South Vietnam, Saturday, March 23, 1975 following the evacuation of Banmethuout and other population centers in the highlands to the west. 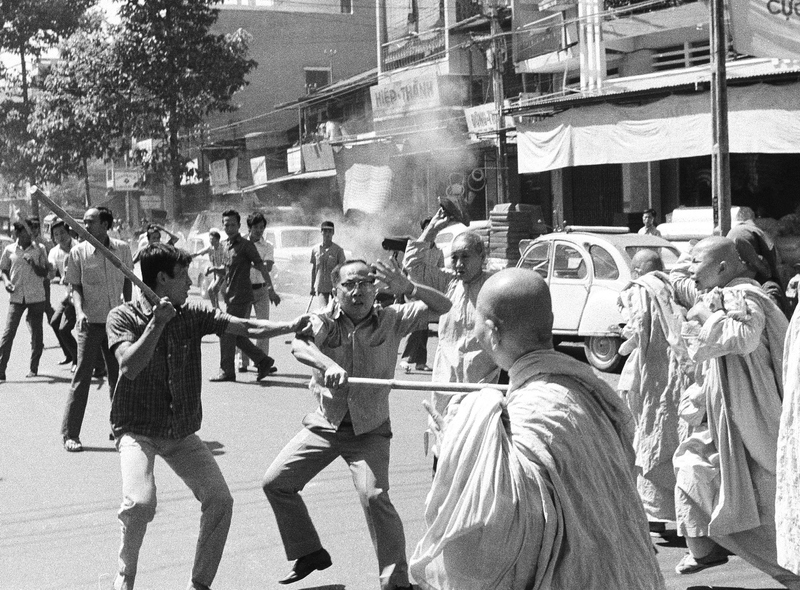 Two stick-wielding plainclothes policemen fight South Vietnamese Buddhist nuns in Saigon, Sunday, Jan. 26, 1975 during anti government demonstration. Officer (left) warns comrade that nun (background) is about to hit him with sandal. Melee occurred following political convention at pagoda. 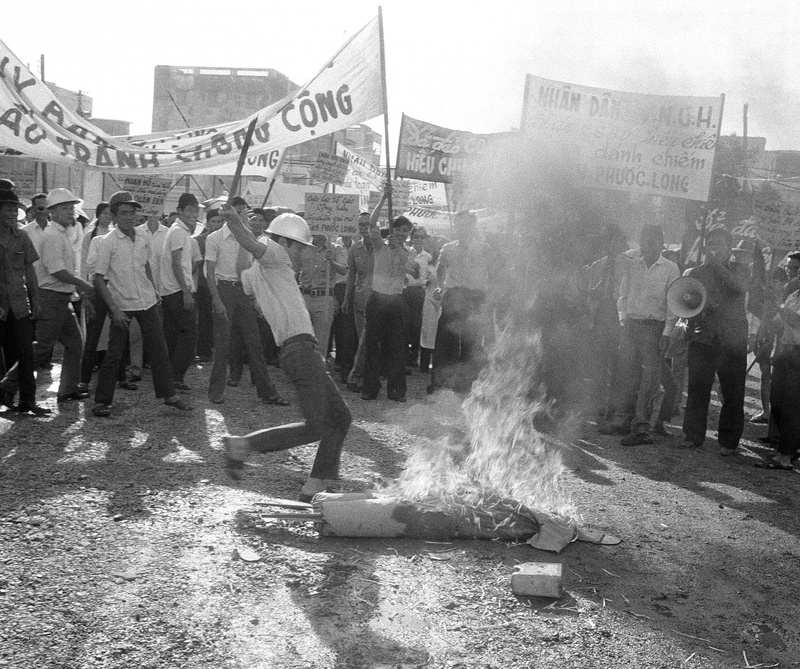 Anticommunist demonstrator kicks burning effigy of Viet Cong soldier during unruly protest outside Saigon headquarters of International Commission of Control and Supervision in Saigon, Jan. 6, 1975. About a hundred demonstrators protested fierce fighting in Phuoc Long province in violation of the Paris peace agreement, which the ICCS is charged with enforcing. 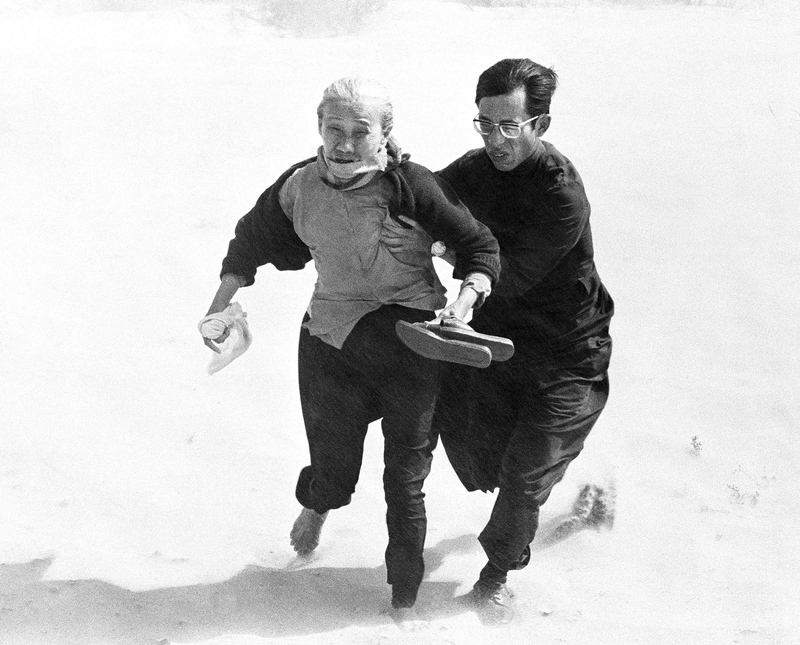 A Roman Catholic priest aids an elderly villager to brave the windy rotor blast from a government helicopter as they run to board it from west of Tuy Hoa in Vietnam, Wednesday, March 27, 1975. 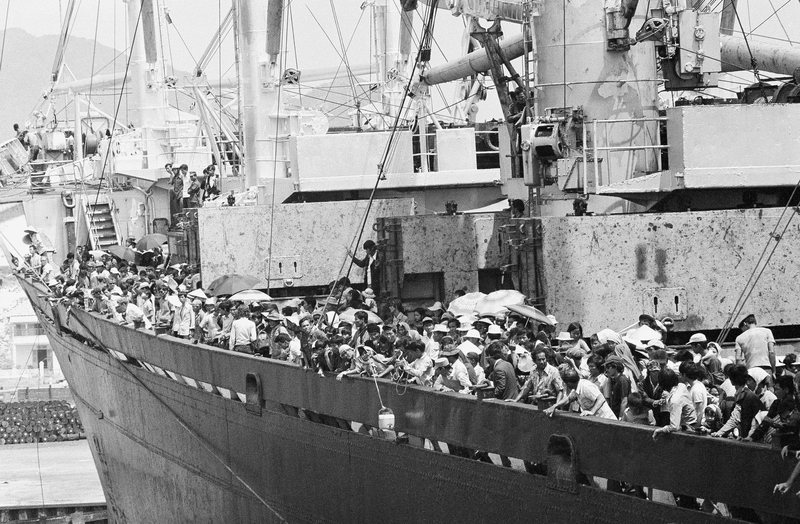 They were among thousands of refugees from the Central Highlands who were picked up along the central coast.